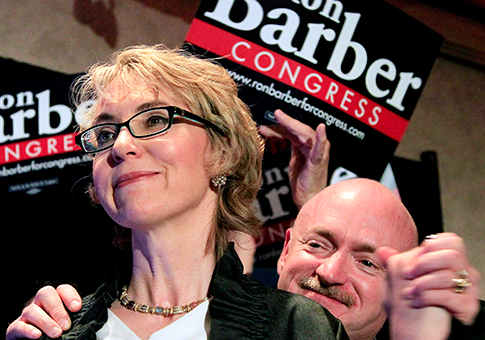 The gun control advocacy group led by former Congresswoman Gabby Giffords (D.) endorsed two vulnerable Republican senators on Monday. The congresswoman and her husband and group co-founder Mark Kelly revealed in an op-ed for CNN that their group, Americans for Responsible Solutions, would back Sens. Mark Kirk (R., Ill.) and Pat Toomey (R., Pa.) in their competitive reelection bids. "This fall we’re undertaking a campaign to ignite the vocal majority of gun-sense supporters from coast to coast," the op-ed says. "And we’re standing by our friends who have championed smart gun laws in Congress. Some of those friends are Democrats; some are Republicans. All of them know how urgently we need to do more to keep guns out of dangerous hands. Saving lives should be an American priority, not a partisan litmus test." The two pointed to Kirk and Toomey’s break with their party in support of a failed 2012 universal background check bill as a key moment in earning their endorsement. "In the wake of the tragedy at Sandy Hook, Republican Sens. Pat Toomey and Mark Kirk broke from the gun lobby and supported a bill to help prevent felons, domestic abusers, and the dangerously mentally ill from obtaining firearms at gun shows and online," Giffords and Kelly wrote. "This week, they are earning our organization’s endorsement." Toomey, who is currently locked in a competitive reelection race, touted the group’s endorsement. "I am honored to receive this endorsement from Americans for Responsible Solutions in recognition of my work to keep guns out of the hands of violent criminals, terrorists, and the dangerously mentally ill," Toomey said in a statement. "I have long said that we must work together to forge a bipartisan consensus on gun safety, rather than talk past one another with partisan rhetoric. While protecting the constitutional rights of law-abiding citizens, I am committed to bridging the partisan divide to crack down on illegal gun trafficking, close the terrorist gun loophole, require background checks on transactions at gun shows, over the internet, and between non-family members, and also ensure Congress is funding research into our country’s gun violence crisis." "I look forward to introducing a bill next Congress that works to achieve these ends," the statement added. This entry was posted in Politics and tagged 2016 Election, 2nd Amendment, Gun Control, Guns, Illinois, Mark Kirk, Pat Toomey, Pennsylvania, Senate. Bookmark the permalink.